Although few Russians seem to know the exact history behind the Day of Russia, this national holiday is taking on a meaning of its own as the Russian people continue to develop their political institutions. Celebrated annually since 1992, the Day of Russia marks the date when the First Congress of People's Deputies of the Russian Federation adopted the Declaration on Russia's National Sovereignty. Since that historic moment, the Russian people have been moving toward full-fledged political maturity. Russia has already passed through a dizzying array of stages since the collapse of the Soviet Union – from Yeltsin’s era of economic liberalism, which was more reminiscent of gangland Chicago of the 1920s, to the Putin era, which saw a brutal conflict in Chechnya, down to Medvedev’s presidency, where renovation and reform became the new catchwords. Presently, historical events have come full circle as emphasis is being placed once again on democratic reform and renewal. Average citizens have taken an interest in the political process, as is evident in the turnout at recent rallies and demonstrations. Today, thanks to a host of new social media technologies, laptop revolutionaries regularly spill their spleen, however diseased, in electronic forums for immediate consumption. This virtual political awakening on the part of some Russians – many of whom are too young to remember the excesses of the Yeltsin era or appreciate the later achievements of Putin – has led to a timely reconsideration of some of Russia’s more controversial laws. For example, former President Dmitry Medvedev recently signed into force a law on gubernatorial elections, which had been a sore spot for many protesters. “This law enters into force and from now on all top officials in the federal constituents of our country will be elected in a direct, equal and secret ballot by all citizens, who live in the federal constituent,” he told reporters. Today, a sitting governor can be removed from office if 50 per cent of voters in a region reject the official in a special recall election. The bill also restricts governors to two consecutive terms in office. The government also approved a law that reduces the minimum number of party members to 500 from the previous 40,000, while easing the bureaucracy-heavy registration procedure. Such political restructuring is intended to stem public disaffection in the political process, which seems to have become more of a global phenomenon, perhaps due to the ongoing economic crisis. Whatever the case may be, the noticeable decline in enthusiasm for street protests seems to indicate that the political reform initiatives are working. Russian leaders, it must be stressed, have expressed all along their approval and even enthusiasm for this outpouring of national civic-mindedness. After all, civic participation practically vanished in the post-Soviet years as people diverted their energies into the pursuit of careers and material wellbeing. Now that many Russians are enjoying a capitalist system, and are possibly even a bit jaded by the whole thing, many have found an outlet in political activism. 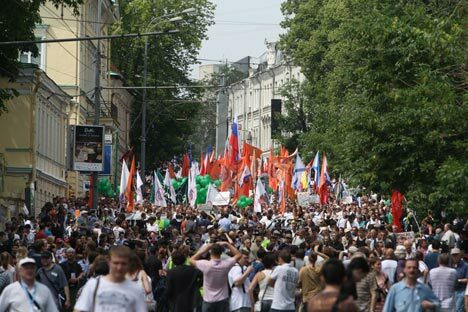 Meanwhile, as the Kremlin has demonstrated its willingness to embrace the revival of civic initiative, it is also sending an unmistakable message that it will not tolerate anarchy on the streets. All future political rallies must fall inside the parameters of the law, and will face stiff penalties if they do not. On Friday, President Vladimir Putin signed a new bill into force that will see those accused of participating in illegal rallies fined up to $10,000. The Russian leader stressed that the new law is not much different from existing European regulations. In a nod to democratic transparency, he also requested that the Constitutional Court analyze the bill in order to determine if it may need amending at a later date. Given the new political atmosphere in Russia, it remains to be seen how Putin, who has thus far proved himself a masterful politician with excellent instincts, will adjust his sails to the shifting political winds. It must be noted that during Putin’s first term as president, he was forced by circumstances to introduce what may now seem like drastic measures. Yet the initiatives were implicitly designed to keep the state from breaking apart. This is in no way an exaggeration. Just a little over a year before Putin was elected president, Russia was struggling to emerge from not only deep financial crisis (the rouble tanked on August 17, 1998, which resulted in Russia defaulting on its international debt, and millions of Russians losing their life savings), but from an expensive anti-terror campaign in Chechnya. Meanwhile, the so-called oligarchs were attempting to direct the flow of political events from behind the Kremlin walls. In short, Russia was on a rollercoaster ride when Putin first came to power. It would stand to reason, therefore, given the extreme conditions that the country was facing at the time, that an extreme response was unavoidable. Now that Russia is showing all the hallmarks of a healthy democracy, with even some colorful protests and political parties under its wings, it will be interesting to see if the members of the political opposition will be willing to meet Putin halfway, working with him to bring Russia to the next level of its political development. That, in effect, is the real spirit behind the Day of Russia holiday.